In previous tutorials we learned how to make applescript open a web page, how to use AppleScript to fill out forms on a web page, and how to click buttons on web pages with AppleScript. Today we are going to learn how to extract data from web pages using AppleScript! In a later tutorial I will teach how to put all of this information together to make a fully automated application that collects and/or inputs multiple bits of data from a website or websites. For this first example we are going to use Google Chrome’s inspect element tool and grab the first line of a Google search result. If have not read my previous two tutorials on clicking and inputting data, this will not make much sense. Please view these first! As in the previous examples we are going to need either an ID, Class, Name, or if all else fails a the tag that contains the information that we want. 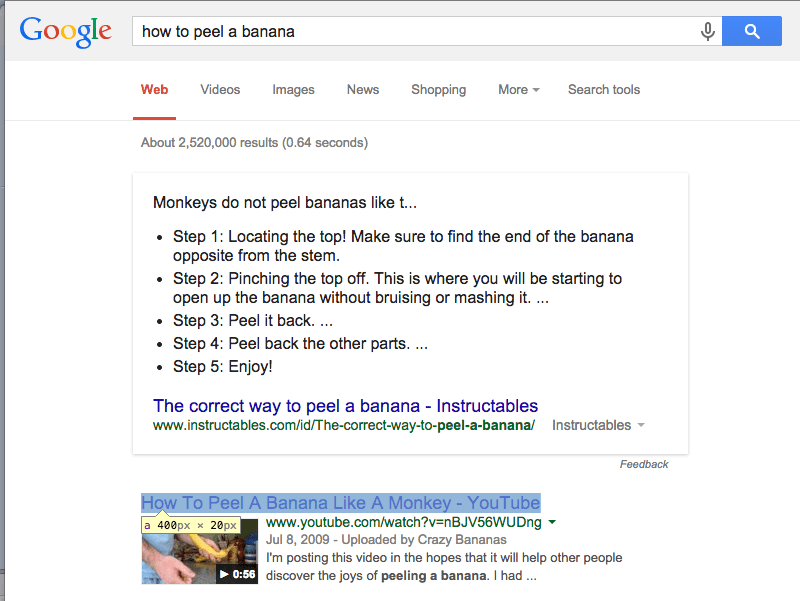 We are going to grab the first headline of how to peel a banana and pull it into applescript. Right click on the element you want to grab and click on inspect element to bring up the source code. It looks like we do not have an ID or Name to go off of, so we will have to use Class. In this instance the 0 would allude to which headline we would like to pull. Hmm, this is good that we have the information that we want, but we also picked up a lot of the HTML. 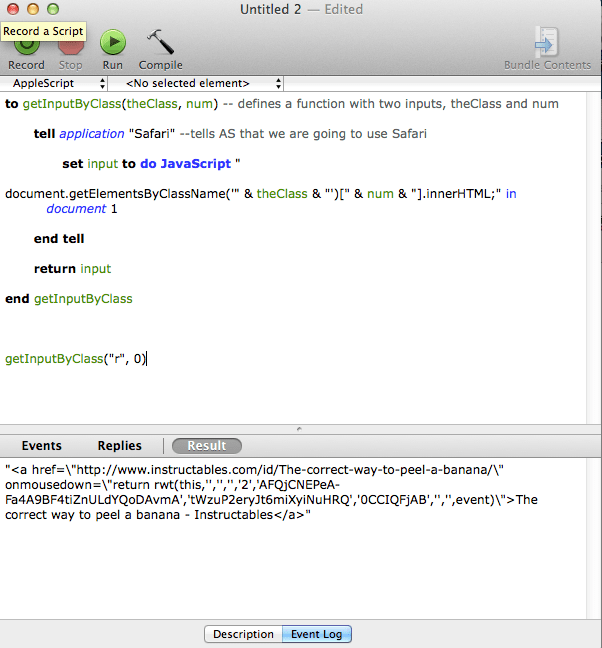 To get rid of the HTML we are going to use AppleScripts Text Delimiter functions. We can set up this function to pull out what is between the lines of code. First we need to set our grabbed text to a variable. Next we set up the call to our function. This function takes 3 parameters. The first is searchText, this is going to be what we retrieved from our getInputByClass Function, or theText above. Which comes directly after the information that we want. See below for how to use other methods to grab data. If you read the previous tutorials mentioned at the beginning of this article you will understand how to use the below code. expected “,” but found identifier. I believe that this was at the “ofbeginningtoend” area. Any suggestions? 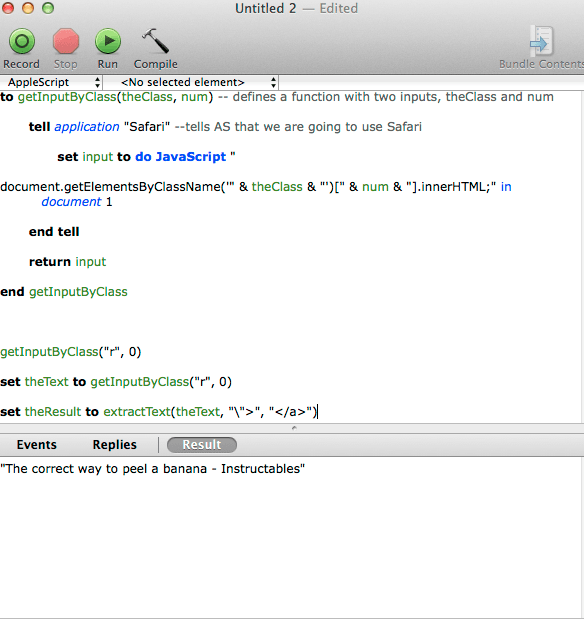 If you send me your applescript, or even that snippet of code you believe is the issue I can take a look for you. How can i use applescript to get informAtion from a list of urlS? I Need to retrieve a specific information, the url of The img in a for each specific url, thEy are mAny thousands so i can’t proceed manually. Can you send me an example of what you are looking to do? I sent you an email so we can talk more in depth. Would it be possible to go more in depth with this? This would be very useful for work but I’m trying to extract text from a simple table and output it in a certain format so that I can paste it into another program. I sent you an email. Shoot me an example and I’ll see how we can make it work for you. Hey Samuel, THis is brilliant, I have pretty much combined all this information together and have it all working. I was hoping if there is a way to use the extracted information to add it to an input box on the site. Sounds spammy I know but to explain a little. We joined a wedding photographer sort of directory where couples enquire for availability. To inform of our availability we have to load up a site and input all our date over and over again including a randomly generated number. Help very much apprecaited! Hey Tom, Check out my other post How to fill out forms on a website using applescript. If this post doesn’t answer your question shoot me an email and I’ll help you out. Hey Sam, just thought I would see if you ever got chance to look at this? Great scripts! Exactly what I´ve been looking for. Thanks Ignacio! That part of the script can be very finicky… I’m glad you figured this out and shared it. Is it possible to get the data for multiple nums? when i do the first part it says missing value why? There could be a number of different reasons. Please email me your code and the source code and I’ll take a look. You have to use Safari, this code will not work with Chrome.